In 2009-2010 I changed basses—I wonder if that was a bit of a lightweight mid-life crisis, I suppose, approaching 50 and all that. I determined to find for myself a really nice bass, and spent a year doing so. (Also I’d had a number of years, realistically approaching a decade, where I wasn’t really doing much musically—the day job, family life, as well as a health crisis that knocked me off track, other things taking up my time and energies. I had to decide whether I really was a musician any longer.) I sold my old one to a local orchestral player. So now I have a mid-19th century German or just possibly English bass, which has a great sound I think, pizzicato or played with my Alfred Knoll bow, and Thomastik Spirocore light strings. 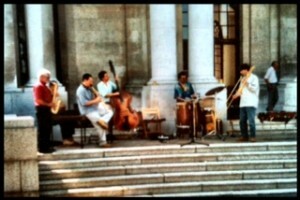 What a burst of energy that old instrument has given me, generously making me sound good (to my ears)! I am musically revived. 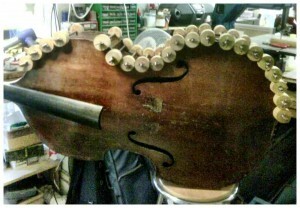 There was quite a bit of work to be done on the bass still to get it back to top form, so I visited my luthier at the Violin Shop in Blackpool quite regularly during this period. UPDATE 1! 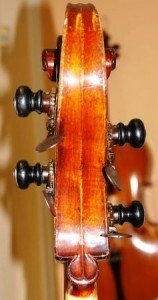 My new bass is now (May 2011) completely and wonderfully restored, thanks to the work of luthier Simon Speed at the Violin Shop. 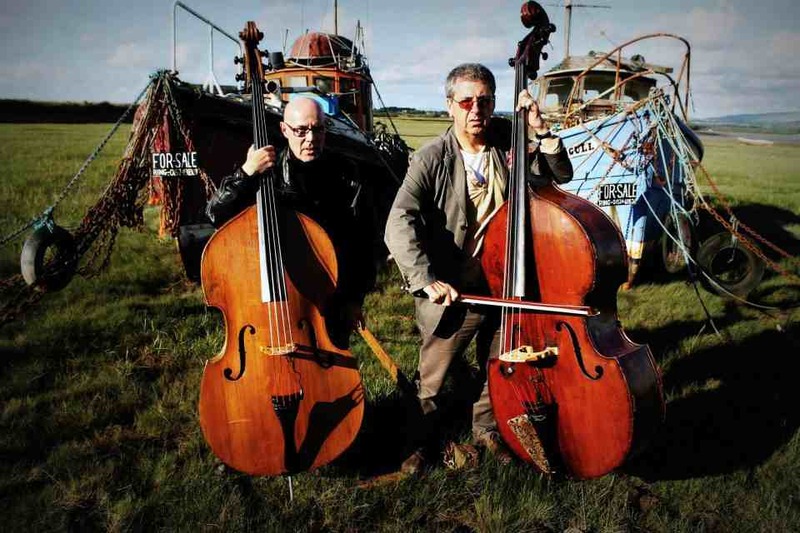 I am quite thrilled with the way the bass sounds and looks, really, and cannot recommend Simon highly enough for his sympathetic and dedicated work. UPDATE 2! 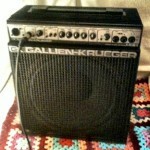 I have fitted the new bass with a new pick-up (September 2011), a David Gage Realist pick-up. What a difference to particularly the quality of depth at the bottom end it makes. Hit bottom E, F or G and the room rocks like a BOOM-SHANKAH! 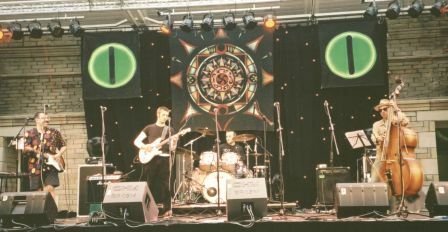 For the final, most recent bands, in Lancaster— these were Adverse Camber double bass duo (later trio with drums), Swerve Trio (soprano sax, drums, bass)—see the dropdown pages under this Music section. I did other things too, odd interesting invitations, collaborations. The film below shows part of one such, an ‘improvatorio’ for voices and strings, freely improvised, by Deep Cabaret Vox (aka Steve Lewis, the one in the colourful shirt), from Lancaster Jazz Festival 2011. I was part of the bass section for this, great fun, with Ken Johnston and Dave Tomkins. To my great pleasure one of the singers Steve invited in was my old CME pal Mary Keith, lovely to see and play with her again. I was (back) in Glasgow in the late 1980s / early 1990s, doing my PhD at the university. 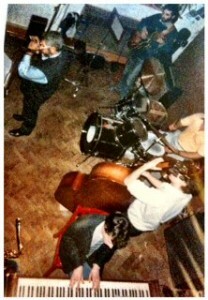 Played a lot of music there, leading a quartet and a duo under my own name, and as a bassist in others’ bands too. For the quartet—with Crawford McCallum (g), Matt Jenkins (ts, ss), Nick Weston (d)—I ended up writing much of the material, some of which wasn’t too dreadful. In fact, I’ve gone back to that book of compositions in the past year or two to play in new situations. Glasgow was European City of Culture in 1990 so there was a bit of work around for everyone. 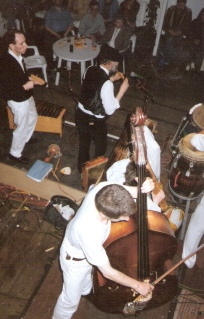 One of the main bands I was in was called Atsimevu, a drum ork, with me on bass, talking drum and balafon; I remember one year we did a community tour of Glasgow estates and processions during Mayfest, and we played some big venues too—the Tramway on the South Side, and Partick Town Hall. 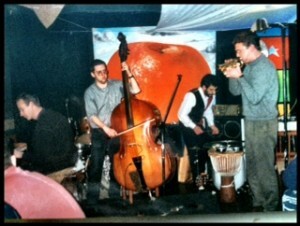 We did a tv show once, playing live (anyone got the footage?). I was bassist for John Longbotham for his trio for a while too (with George Burt on guitar)—he was probably technically the best alto player I’d ever played with, and wrote some fabulous music, when he was on form and balance. 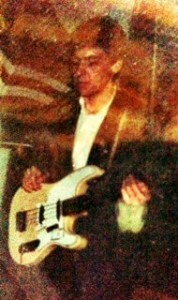 I worked as a community musician in the mid-1980s, originally one a government scheme to reduce the unemployment figures. Working with Community Music East I did learn about music of course—particularly how to count, and how to listen, and just benefitted from the general discipline of regular playing to sharpen up the chops—but also I learned about teaching, how to teach, that was important bearing in mind me going on to become a university lecturer. 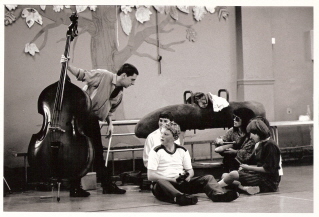 I was in the first tranche of people employed by CME, and worked alongside good and wonderful musicians—they were all better than me by far—like Ben Higham (trumpet, tuba), Mary Keith (flute), Gill Alexander (bass), Sian Croose (voice), Will Lorenzo (drums, RIP), Pete Beresford (piano), Pete Kitson (drums), Steve Clarke (tenor sax). Some, er, characters there too, you know. 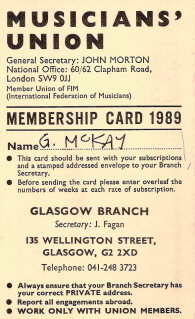 Apart from all the stuff with CME, some of the main music-playing memories I have from those days are from playing with my dad, also George McKay (RIP). 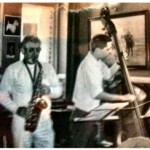 When we played together he was mostly on alto, bari and flute. I really loved playing with him, he was such a forceful player—by which I think I mean that his tone, especially on alto, was both forceful and lyrical. His solos sometimes blew me away, just as they’d done when I was a kid and would listen to him practise (there was no escape). 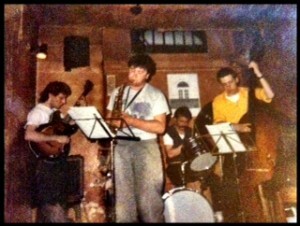 With hindsight I wasn’t really then quite good enough to play with his bands during these years, but we’d do gigs, quintet, quartet, duo (bari and bass was so great). I learned on his stand. 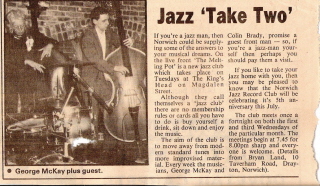 I was bassist in the Simon Youngman Quintet too, playing modern standards, and had a sax/bass duo with Steve Clark from CME, and I ran an improvising club called The Melting Pot for a while, and I had a reggae/blues jamming band with old north Norfolk mates called The Last Blast that actually did play a gig (yes, one). I’m sure I’ve photos of most of these somewhere, will add them when I can.